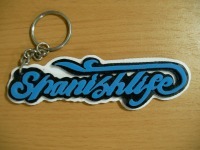 As you can see, it's a key holder with "SPANISHLIFE" character on it. This word is my favorite sentence and I use it for my e-mail address too. But, what is special with this thing… ?? It's handmade by the key holder guy. Left hand picture is the guy rough copying character on the plastic board. This key holder shop was opened in the event when I visited Malaysia. If you want to get this, you have to make reservation with your own characters and choose 3 colors for the plastic design. It takes about 30 minutes, but you can enjoy watching how he creating this key holders. This is the movie of cutting plastic board with small saw. It's really fast and precise! I was really surprised with they don't use any electric machinery to making this key holders. They made it by hand and just using some kits. 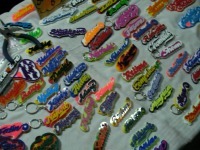 In front of the shop, there is several design of key holders are displayed. 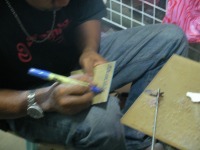 Everybody has interested with this stuff and they tried to see how he creates these amazing key holders. I felt this guy practiced really hard with making such a beautiful characters by just rough copying only once. It really looks like a made by electric machineries. This is definitely only one SPANISHLIFE key holder in the world.